Computes the Voronoi diagram of specified points in a plane. X-coordinates of the Voronoi points. Y-coordinates of the Voronoi points. An n-by-2 array of indexes of the Voronoi points, where n is the number of edges in the Voronoi diagram. Each row of Voronoi edges represents an edge of the Voronoi diagram defined by the indexes. For n given points in the plane, the Voronoi diagram divides the plane into n Voronoi cells. Each given point belongs to one Voronoi cell. 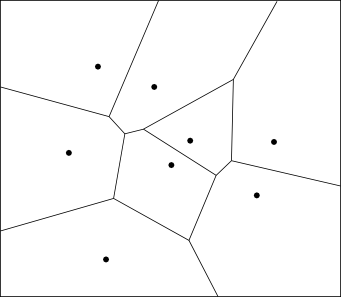 The point in a Voronoi cell is closer to the corresponding given point than to any of the other given points. The following figure shows an example of a Voronoi diagram of eight given points.